Saturday I wrapped up my last race in the Virginia Triathlon Series, the Giant Acorn International. The weekend event offers an International on Saturday and a sprint on Sunday. And just like last year, the weather was great on Saturday and much colder on Sunday. 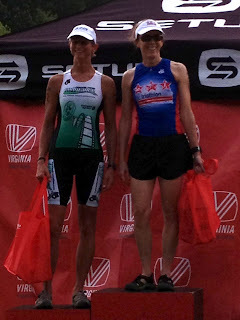 I was very glad I picked Saturday's International, unlike last year when I did the Sunday sprint with my friend Krista and it was in the 40's and raining as we got ready to swim! Saturday's weather conditions were near perfect upper 50's to lower 70's with 79 degree water, thanks to the nearby North Anna Nuclear Plant (and no, I'm not glowing; the water is used as a heat exchanger). 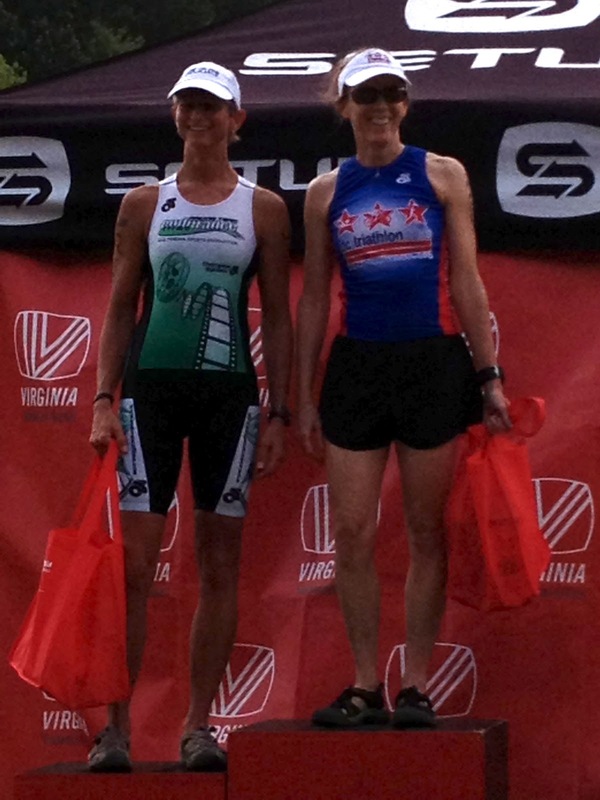 I finished 5th overall, 2nd master's, just 15s behind Cynthia Hutchings who rightfully earned the top spot by passing me on the final run lap. If you want the short version of the race report, this brief exchange tells it all: "I felt awful on that run." "You LOOKED awful on that run." Mediocre swim. Strong bike. Battles with mental demons, missing gears, and much suffering on the run. All part of the mystery and FUN that is triathlon! Here it is, by the numbers (full results here). 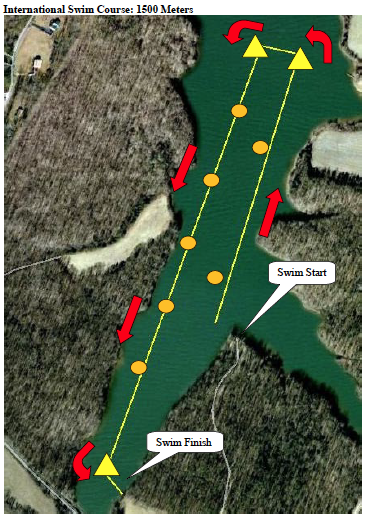 We raced in a different part of the lake this year and the venue presented some challenges. Transition was in a bush hogged field with thick, blunt stalks that were a risk to bare feet so I took some good advice get to and from the mount/dismount line with bike shoes on (rather than barefoot with shoes clipped in). I was unfortunately at one of the racks furthest from bike out and in and the rocks and stalks and small embankment made it tricky to run in bike shoes and push the bike! A few people suffered flats just rolling their bikes out and some of the lead guys chose to carry their bikes out over the weeds. I'm not complaining at all. Part of the sport is adapting to the particular race conditions and venue. Consider the alternative - sterile, contrived, cookie-cutter race venues. McDonald's of racing. Who wants that? Not me. Give me the quirks that come with each race! 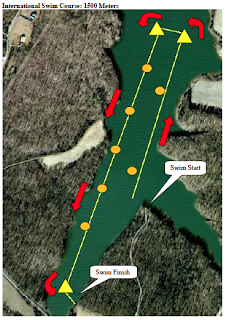 The swim was in a protected cove and was a nice long rectangular course. The water was sprinkled with acorns...not giant ones, but acorns still! I swam in my Aquasphere "speed suit", which in my case is more appropriately described as a "less-slow suit". 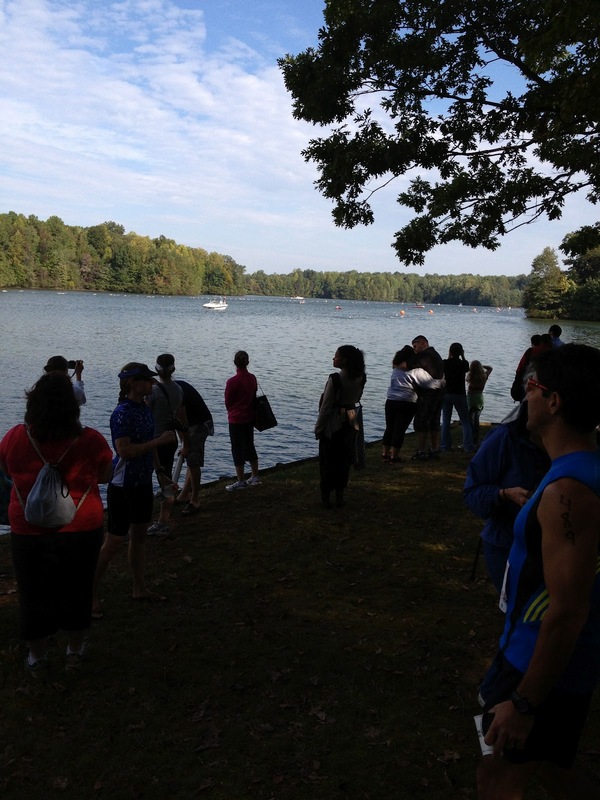 The swim FELT good and strong but was not exactly fast. I must have been enjoying it since I'm sure I added a few hundred meters by swimming wide left on the out AND the back. With about 250m to go, my left foot started to cramp, so I tried to swim harder, thinking my body would then be too busy to bother to cramp the foot. It sort of worked. I LOVE biking and I LOVE my bike. LOVE it. This is a great course - scenic, rolling, and good surfaces. I ended up playing a bit of leapfrog with racer Mark Robbins, who went on to win the 50-54 division. He'd pull ahead, I'd pull ahead. On and on this went. We only officially met post-race and confided that it kept us each focused and pushing. 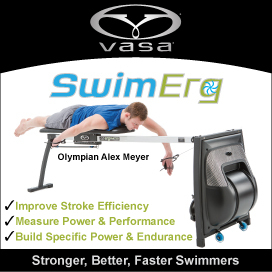 I learned that he was getting over surgery from a bike accident just two months prior, so I don't think he was at peak performance. But I was glad to have him on the course! My Garmin had the bike course at just over 23 miles, resulting in a 22.5 mph average with an average heart rate of 165. Truthfully, it never felt over-the-top hard. I wasn't intentionally saving for the run, but figured I had left myself some room. How wrong I was. The two-loop run course started on the grass/bush-hogged surface, went over a ditch to an out-and-back on asphalt, back over the ditch to the grass, and then a short out and back on gravel. (Again, not complaining, just describing.) Maybe it was the multiple surfaces, but I just never found my groove out there. Maybe this is where my week of being under the weather came back to haunt me. My run was stiff and shuffle-y and defiant and grumpy. It was a 7:52 pace with an average heart rate of 169 -- telling me I did not have much more to give. Contrast that to a recent 10k done in training (as a brick following a moderate hour-long bike ride) that was almost a full minute-per-mile faster. My Nationals 10K was a sub 7-minute pace too, so for me, this was run was off. It was frustrating....and it hurt! I spent the 47+ minutes in self-coach overdrive, pulling out every trick in the book. And whoever the woman was, running with the tiny hand-held radio playing "Eye of the Tiger", thank you for that!! (That's one way to get around the no iPod rule!). I also want to say thanks to the legions of volunteers, most of whom seemed to be girls ages 11-13, who showed more enthusiasm than I have EVER seen handing out cups of water. I appreciated it since I grabbed water at every aid station and dumped it on my head in the hopes of waking up whatever part of my brain I needed to run to my capability! I got through the run. It must have been slow and hard for everyone because I ended up with the 4th ranked run among women. All-in-all a good result in spite of being under the weather and fatigued earlier in the week. 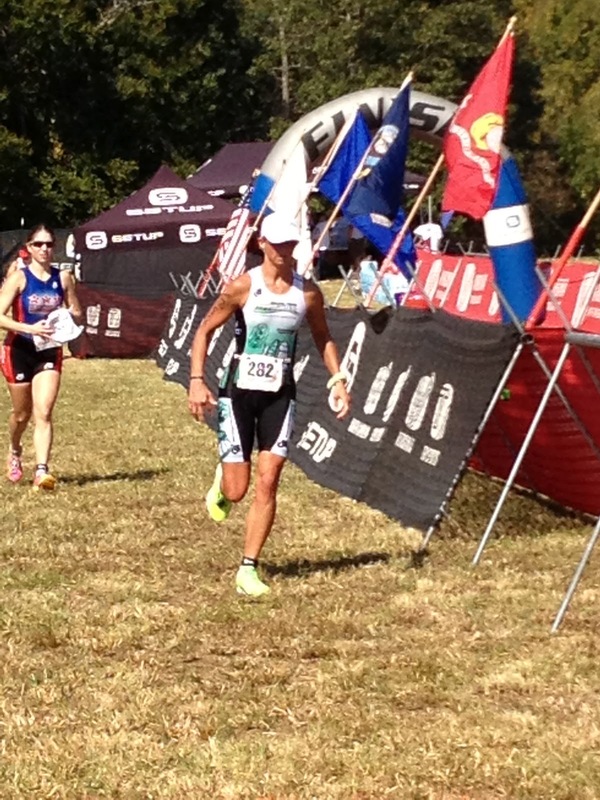 I'm glad I raced and came out of it safely and feeling energetic and healthy again. 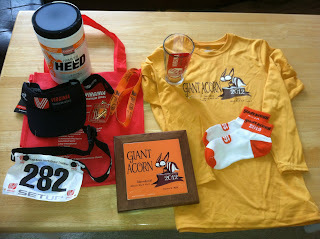 And, I made out like a bandit at this race!! 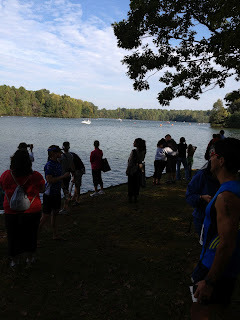 I very much appreciate Set Up Events and the Virginia Triathlon Series. They consistently run top-notch events. It's been a fantastic 2012 season. Thanks to the community of Bumpass and Lake Anna -- again, outstanding volunteers! Alright, NOW I can start packing for New Zealand! !